After "Are you still writing for that paper?" and "Why did I assume you were dead?" the question I'm most often asked is, "So, what's good on TV?" Sure, I write a readily available weekly column about what's good on TV (and not-so-good), talk about it on X96's Radio From Hell and produce a podcast (TV Tan—look it up on iTunes and Stitcher) covering the same. But you can't be expected to keep up with it all. Quality programming? Ain't nobody got time for that. You do, actually: Let's pretend that daily "live" TV viewing didn't die along with print journalism several years ago and scroll through the week with a day-by-day breakdown of what to Watch (good stuff deserving of your attention)—and, for the hell of it, Hate-Watch (stuff so terrible that it's fun to mock) right now. Or, DVR it for a weekend binge—I don't know your lifestyle. The network tried to kill its biggest hit by moving it to Thursday nights, but The Blacklist (NBC) is still a must-Watch. TV critics are divided on The Comedians (FX), but I say it's a worthy lead-in to Louie, and that's all that matters. On the Hate-Watch front, there's Lip Sync Battle (Spike), a "singing" competition that has done away with singing altogether. Jimmy Fallon's next "viral innovation:" Celebrity Naptime. Real Time With Bill Maher and Vice (HBO) for politicos and news junkies, The Soup for pop-culture catch-upists, and The Grace Helbig Show (E!) for ... not sure who this is for yet, but Helbig's YouTube-to-TV transition is, more often than not, as funny as it is brain-implodingly awkward. Also, Children's Hospital (Adult Swim), because even you have 11 minutes to spare. Hate-Watch: The Messengers (The CW), wherein impossibly pretty CW actors fret about the Rapture and a desolate Friday night timeslot. Orphan Black (BBC America) is one of the rare sci-fi dramas that lives up to its hype. Just don't be put off by all of the clone characters (most played fantastically by Tatiana Maslany)—if you can follow Game of Thrones, you can follow this. Same goes for the time-jumping Outlander (Starz), the lushly produced Scot-drama that earns its nickname "Fifty Shades of Plaid." For Hate-Watching, My Cat From Hell (Animal Planet), because no one seems to realize that you can find a new, less-hellish kitty, oh, anywhere. Busy night, with Game of Thrones, Silicon Valley, Veep and Last Week Tonight With John Oliver (HBO); Mad Men (AMC); Salem (WGN America); Bob's Burgers, Brooklyn Nine-Nine and The Last Man on Earth (Fox); Mr. Selfridge (PBS); and now the new Happyish (Showtime) all vying for discerning eyeballs. Set aside some Hate-Watch moments for A.D. The Bible Continues and American Odyssey (NBC); they've really earned it. Bates Motel (A&E) has cranked its simmering insanity up to full-tilt bonkers this season, while The Returned (A&E) continues its supernatural slow-burn—together, they comprise the creepiest two-hour block of the week, not counting Sunday-morning news shows. Hate-Watch Turn: Washington's Spies (AMC), which is as obtuse as a tri-corner hat and somehow even duller than actual American history. 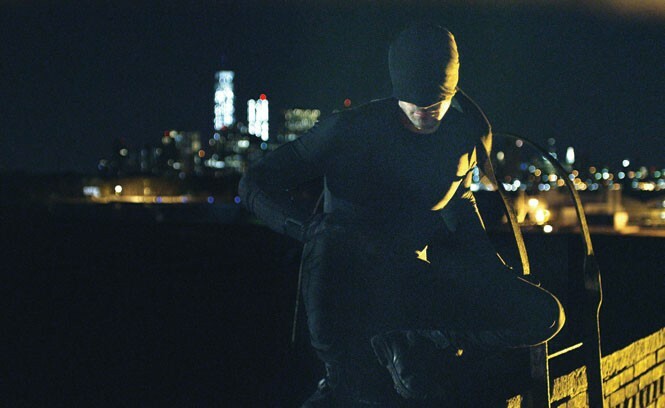 Catch up on your streaming—there are unseen episodes of Daredevil (Netflix) and Community (Yahoo Screen) still waiting for you. Hate Watch: Powers (PlayStation Network), the comic-book adaptation that can't even. Heard of Big Time in Hollywood, FL (Comedy Central)? It fills the sick-wrong-funny gap left by Broad City where Workaholics failed (Comedy Central). The obvious Hate-Watch is CSI: Cyber (CBS), the stoopidest depiction of tech-terrorism since every "cyberpunk" movie produced in 1995. Do not, repeat, do not respond to any e-mails from your parents re: "Black Hat Hackers." Listen to Bill on Mondays at 8 a.m. on X96 Radio From Hell; weekly on the TV Tan podcast via iTunes and Stitcher.